Back to the world of D&D. 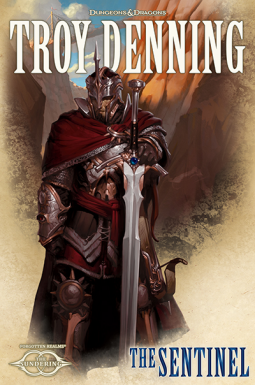 I have received the fifth installment of The Sundering series. We are starting to really draw to the end of this rollercoaster. We are looking at the last incline before the great, exciting plunge at the end. So far, I have enjoyed only the even numbered authors. Will Troy Denning break the pattern? Unfortunately not. With the fifth installment of The Sundering series, I feel like I have stepped into a separate world again. Byers was starting to put all the pieces together for me. He even had a character bleed forward from Evans's novel. A world was building and a picture was developing in my mind. With the The Sentinel, I felt like I spilled developer solution all over the beautiful picture and now have big splotches covering up half the frame. We have a new cast of characters that seem to have no relevance to the previous books. They are just yet another group of Chosen for yet another group of gods I don't recognize. We are still in the Forgotten Realms, but suddenly we are in yet another part of it. I went back to having no clue where I was. I understand they are each stand-alone novels telling the story to bring the Forgotten Realms forward to modern readers, but there should be some kind of cohesion. Shouldn't there? Or am I just picky? I do have to lay some blame at the fact that I know nothing of Dungeons and Dragons; where this story is certainly meant for the fandom of D&Ders out there. I just don't like reading a book with a wiki permanently open on the computer screen to know where I'm coming from or going to; so take my rant with a grain of salt. Unfortunately, the lost feeling was not my only disappointment with the story. There were a lot of ups and downs for me in the actual plot and character development. The point of view switches at random with no segue. I stumbled over that hiccup too many times to enjoy the story. The characters themselves are caught up in a rather unusual love triangle that is there one minute and gone the next. Is the romance aspect really supposed to be there or did the author feel forced to add it for an expanded reader base? The whole development was stunted and butted into the story in a jarring way. It does seem that Shar, the goddess of destruction, plays some kind of overarching role in all the novels. Each author has mentioned her in some way. They all seem to be involved with avoiding, manipulating, or destroying her nefarious plot to swallow the world. I guess I will have to wait for the last book to see how this game plays out, because I have to admit I am at a complete loss after I felt like I was starting to get it. Now for some things I did enjoy about this book. I really liked Arietta, but that could be contributed to loving archery (and therefore almost every character who uses it). The action scenes were very well paced and exciting. A rather limited list I admit after looking at my rants. I rate this book 3 stars. Sometimes I felt like it was a four, others time only a two. I ended up not being really sure if it was worth the read or not. It comes out in two weeks, so visit the amazing Wizards of the Coast page to make the call for yourself. For the individual book: here. For the overall Sundering series: here.